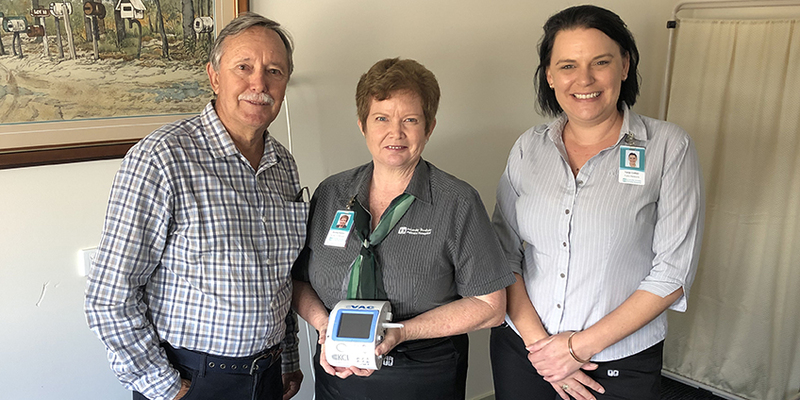 The Friendlies will be able to offer improved recovery time and comfort to patients with wounds, thanks to the purchase of a VAC Therapy System wound care machine, made possible with a grant from the St John’s Grace Fund. Due to increasing number of surgical patients at The Friendlies, The VAC Therapy System is a welcome addition to the current equipment available for this kind of wound care. It assists by providing an optimal environment for healing and the removal of fluid to enhance the healing process, improving recovery time, independence and patient comfort. Unit 3 Nurse Unit Manager Donna Stallan said the machine was useful for both surgical wounds, and also other patient wounds such as ulcers, injuries, burns and skin grafts. “In addition to being a good option for a lot of patients, it also is a benefit to nursing staff as it reduces the amount of time spent redressing wounds,” Mrs Stallan said. Public Relations Officer Tunja Cotter thanks the St John’s Grace Fund for its grant of almost $15,000. “As a not-for-profit hospital, receiving grants like this one means we offer more patients access to these kinds of treatments,” Ms Cottier said. Image: St John’s Grace Fund’s Wayne Bauer, Nurse Unit Manager Donna Stallan and The Friendlies Foundation’s Tunja Cottier.